Pastor Maxconne Cenneaque preaches here at his church this morning! Cindy, Deb, Dr. Julie & Karen discuss meds and patients. Rosemary Proctor works the pharmacy! Josette has a big smile for Dr. Jack from her hospital bed! This time Vanessa gets to ride on the motorcycle with Hannah! Sandy gets to bathe the newborn! Ysemerline stands for a little therapy and is pictured with her mother and two brothers! Oh! Yes ... and then there's Deb & Hannah! Ysemerline gives another wave to Dr. Brad! Now I'm Dr. Rick's friend! Josette being transferred to the hospital in the back of our truck! Dr. Rick Lapp and two Red Cross Hospital doctors outside the OR tent. The operating room suite the Red Cross Hospital has set up in one of their tents! It is fully equipped and has air-conditioning! Dr. Rick Lapp converses with two doctors from the Red Cross Hospital. We had taken three patients there this evening who need surgery but we were turned away for lack of beds. Perhaps tomorrow they will call saying they can take the patients. Josette is a 15 year old who has multiple fractures of her pelvis. She laid by a dusty road since the earthquake. We have stopped by frequently treating a wound on her back and getting her the nourishment she has desperately needed. Now she lies in a Red Cross Hospital which recently set up almost right across the road from us. She is not a candidate for surgery, but she will have a long painful recovery. 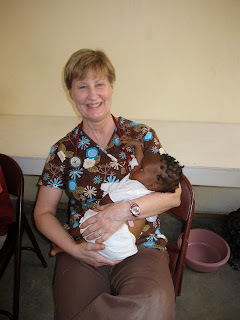 A new medical team arrives in Carrefour, Haiti. Dr. Rick welcomes Karen Smith, Cindy Tischio and Dr. Julie Redcay! Tending to a mother who just gave birth to a bouncing baby boy! We could not understand a change in plans for today, until this mother-in-labor came to our clinic. Bro. Mobley is at the Airport to receive the next medical team coming in. The pastor who was to take us to a mobile clinic today never showed up. But God knew all about it. Vanessa in all her glory! Deb Solley considers crutches for a patient! Deb does a quick exam. One of Dr. Brad's favorite patients now has spica cast. She waves to him after she is given some crutches by Dr. Rick. Dr. Brad has returned to PA.
Vanessa holds a dear little girl. Dr. Rick works on adjusting a set of crutches for a Ismaela. Dr. Rick sweats away but still works hard! Matt & Alan work the "pharmacy"
Vanessa & Barb are still all-smiles despite the horrible heat! This dear little three month old boy was brought to our mobile clinic critically ill. Pneumonia led to respiratory distress, which led to cardiac arrest. Lots of other problems presented themselves. We knew we needed to get him down to our main clinic, but had no time before he died. If we had just known one day sooner, no doubt we could have saved his life. The poor mother went hysterical and many tears were shed! Thanks for your prayerful support. The baby all cleaned up and dressed to give to his mother -- but she was gone. Others carried her baby to her! Rose Mary Proctor, Don Mobley, Rick Lapp, Deb Solley & Tim Slavens on the job! One of the first to make her way to our mobile clinic today! Deb Solley, Rick Lapp and Rose Mary Proctor arrived this afternoon. Hannah McDowell and Dr. Tim Slavens are happy to see them. Rose & Deb get started right away with a bad leg wound! A Haitian mother keeps a close eye on her baby in a mosquito net being treated in our clinic! Vanessa draws water in a syringe for an ear irrigation! The job was not an easy one! Julie Mowery was the pro at it. Sandy helps Barb by writing dosing instructions in Creole. Hannah McDowell begins to check an OB patient. The lady is overdue with her baby and came along down to our clinic to deliver. She very well may be our next delivery! Dr. Tim applies a splint cast to this dear lady. Both of her forearms were broken! We are so grateful for the new shipment of around 2000 lbs of supplies brought to us yesterday. Many thanks to all who contributed in some way for this huge blessing! Nothing like a pre-natal exam in public! Matt cleans a bad foot wound! Hannah debrides two bad burn wounds! On our way for a mobile clinic! The Doctors meet the mayor! A kitchen of the homeless on our property. Hebert, a dear haitian friend! Hannah holds our horribly burned baby girl.